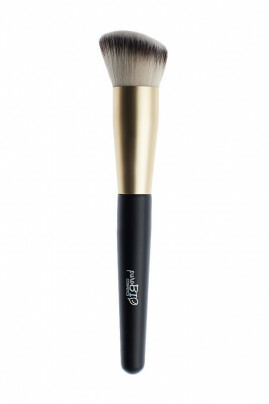 The Purobio Angled Blush Brush is perfect to apply your blush or bronzer on your cheekbones! Made of ultra-soft synthetic hair, it is suitable for very sensitive skin. Its angled shape and the rounded cut of its supple and flexible hairs makes it easy to sculpt and define facial features. The Purobio Sculpting Angled Blush Brush gives a natural and homogeneous effect to refine your face! Sculpt your face easily with the PUROBIO Sculpting Angled Blush Brush! With PUROBIO n°11 blush brush, apply your blush on your cheekbones using circular motion. With your bronzer, sweep the powder accross the forehead, then on top of the cheekbones and down the nose and chin.